This entry was published on May 6, 2018. This Topic is also available in the following editions: DiBiase, D., DeMers, M., Johnson, A., Kemp, K., Luck, A. T., Plewe, B., and Wentz, E. (2006). Visualization of uncertainty. The Geographic Information Science & Technology Body of Knowledge. Washington, DC: Association of American Geographers. (2nd Quarter 2016, first digital). 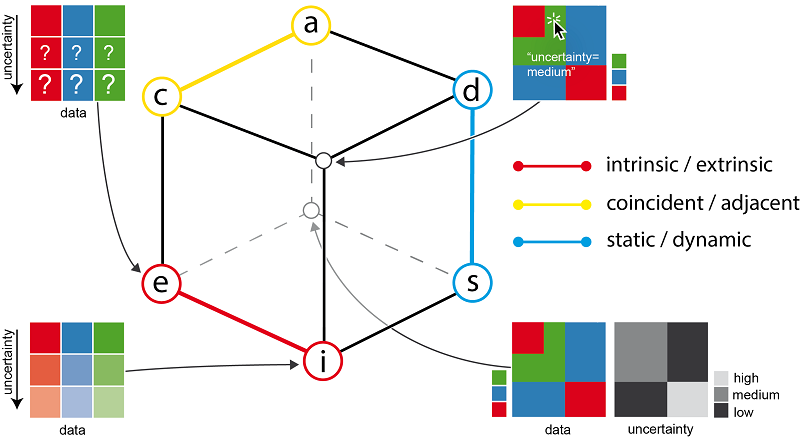 UVis3 (uncertainty visualization cube): categorization for uncertainty visualization defining the three axes "intrinsic/extrinsic," "coincident/adjacent," and "static/dynamic." Uncertainty is a concept that emerged from research on geospatial data quality. In the early 1990s, the NCGIA (National Center for Geographic Information and Analysis) Research Initiative on "Visualization of Spatial Data Quality" addressed the need for exploration, development, and evaluation of visual techniques to communicate uncertainty (Beard et al, 1991). The representation of uncertainty has become a topic of interest in different visualization domains such as geographic visualization, information visualization, and scientific visualization, as well as in related domains such as Visual Analytics and decision science. Several definitions of uncertainty exist within the GIS&T domain and the distinction is fuzzy between related concepts such as data quality or reliability. Here, we adopt the definition by Longley et al. (2005): uncertainty is the difference between a real geographic phenomenon and the user’s understanding of the geographic phenomenon. It is distinct from concepts such as error or accuracy because it acknowledges an unknowable component of all geospatial information. For instance, with an elevation measurement via GPS at a certain point in nature we can assume that there is always some difference between the measurement and the real value. If we know the real value, which is often the case, we can compute the error, which may be 10 m. If we do not know the real value we can apply the concept of uncertainty and estimate that the deviation lies within a certain range, for example, +/- 10 m.
There are many sources for uncertainty of geospatial information. For instance, we work with models of reality that are inherently uncertain (e.g., the unavoidable inaccuracy of interpolated values in an air temperature map) and most data we use come from measurements that are always subject to uncertainty (e.g., incompleteness of census data). In addition, the nature of the data sources can also play a role in causing uncertainty in the collected data, e.g., authoritative data collected by experts following standardized procedures and non-authoritative data collected by volunteers using methods that may not adhere to standardized protocols. In order to make such inherently uncertain data usable for different applications, these uncertainties need to be adequately identified, estimated, and represented. For further information on the concept of uncertainty, see Modeling Uncertainty, Error-based Uncertainty, and Spatial Data Uncertainty. Various typologies for uncertainty have been defined to facilitate its use in practice. The MacEachren et al. (2005) typology, extending Thomas et al. (2005), has received particular attention in cartography and visualization for broad application to locational, temporal, and attribute uncertainties in geospatial data (after Sinton, 1978). It lists nine types of uncertainty (accuracy/error, precision, completeness, consistency, lineage, currency, credibility, subjectivity, and interrelatedness) providing examples for the locational, temporal, and attribute components of geospatial information listed above (Table 1). Recently, Senaratne et al. (2017), after conducting an extensive review on uncertainty and its assessment methods, extended these uncertainty types to also include semantic accuracy, usage, trust, content quality, vagueness, local knowledge, experience, recognition, and reputation. This shows that evolving data and user requirements may call for further types of uncertainty in the future (see Section 3.3). Table 1. Typology of uncertainty of geospatial information (reproduced with permission from MacEachren et al, 2005). Since geospatial information uncertainty can have a strong impact on the outcome of analyses, interpretations, or decisions, representing uncertainty on maps can help users to reduce errors, derive more trustworthy results or acknowledge the insufficiency of data to avoid misinterpretation or ill-informed decisions. Yet communicating uncertainty to the user can be a challenging task since it adds dimensions to the underlying data and therefore increases complexity. Uncertainty representation can be a means to counter this challenge by using visual encodings to communicate uncertainty about information, presenting an often easier to understand reference for uncertainty than tables or numbers alone. However, creating representations of uncertainty can be a complex procedure due to reasons such as the heterogeneity of data, spatial and temporal variation of data, different types of uncertainty in data, and also the various abstract definitions of uncertainty measures that are adapted to suit the context of data usage (Gerharz et al., 2012). The remainder of this section provides an overview on techniques to represent uncertainty visually and discusses the intuitiveness of visual encodings as well as data and user requirements. A wide range of approaches for visual representation of uncertainty exist and it can be challenging to select techniques suitable for specific applications and user tasks. One way to provide guidance with this procedure is to use typologies that help categorize approaches and techniques. Similar to typologies to organize different types of uncertainty (see Section 2) there are typologies for uncertainty visualization that suggest techniques for certain types of data (areas / points / lines, discrete / continuous etc.) and types of uncertainty (e.g., Buttenfield & Weibel, 1988; Pang et al., 1997; Sanyal et al., 2009). Kinkeldey et al. (2014) outline a framework called UVis3 (uncertainty visualization cube) that describes all uncertainty representation approaches based on three design axes: (1) intrinsic / extrinsic, (2) coincident / adjacent, and (3) static / dynamic (Figure 1). Each corner of the cube represents a combination of the three categories. Figure 1: UVis3 (uncertainty visualization cube), extended from Kinkeldey et al. (2014), including four examples: representation of uncertainty by symbol size (top left), color value (bottom left), gray scale in a side-by-side view (bottom right), and by an invisible layer providing uncertainty retrieval through user interaction (top right). Intrinsic / extrinsic describes whether uncertainty is represented as an attribute of existing visual objects (intrinsic, e.g., by manipulating their color) or in the form of additional objects (extrinsic, e.g., symbols expressing the uncertainty). Common intrinsic techniques are color value / lightness / brightness (lighter color = higher level of uncertainty), transparency (more transparent = higher level of uncertainty) or saturation (less saturated = higher level of uncertainty) (see Symbolization & the Visual Variables). Apart from color, the use of fuzziness (blur) to represent uncertain areas (blurry fill pattern) or boundaries (blurry line) falls into the 'intrinsic' category, as does texture (dashed or 'sketchy' lines, hatched areas or similar). Extrinsic techniques include overlaid symbols (crosshairs, emoticons), glyphs (crosses, circles), or isolines. Figure 1 shows an example for an intrinsic technique in the bottom left (color value represents the level of uncertainty) and an extrinsic technique in the top left (size of question marks represents the level of uncertainty). Coincident / adjacent describes whether the information about uncertainty is mapped to the same view as the data (coincident) or to an additional view (adjacent). An example for coincident views are bivariate maps that show the relationship between data and uncertainty (see Bivariate & Multivariate Mapping). Adjacent views are, for instance, side-by-side views or small multiples (see Mapping Time). The bottom right example in Figure 1 is a simplified adjacent view where the data view on the left remains unchanged and the related uncertainty is represented in the right view using a gray scale. Static / dynamic describes whether animations and / or interactive means are used to represent uncertainty. The most common are static visualizations but a number of approaches use animation (e.g., showing an uncertainty layer alternating with a data layer) or interaction (e.g., uncertainty can be retrieved by clicking on an area in a map, see the top right example in Figure 1) (see UI/UX Design). Extrinsic approaches such as symbols representing uncertainty can work very well with clearly defined areas as in choropleth maps. But they tend to focus the eye to the uncertain areas, more than most intrinsic approaches. Adjacent views can be a viable alternative using the advantages of multiple displays to prevent clutter when page or screen real estate is not a concern. At the same time, they take up more space and require more eye movement (Kinkeldey et al., 2014). Static approaches can be printed and used on paper but dynamic approaches are often necessary due to the visual complexity of many maps that makes static representations of uncertainty difficult. The examples in Figure 1 can help with the choice of a suitable approach. location (non-matching locations of objects represent uncertainty). In an extensive user study by MacEachren et al. (2012) on intuitiveness of visual encodings for uncertainty visualization, most of the visual variables that participants found intuitive were linked to a visual metaphor (with fuzziness, location, and color value ranked highest, see Figure 2). Color saturation, however, although often used in uncertainty visualizations due to its "gray out" effect, is not among the most intuitive variables. Apart from this, drawbacks of color saturation include the lack of readability with less saturated colors (that become hard to distinguish), as well as a lack of intuitiveness because users are not always sure if unsaturated colors depict high or low levels of uncertainty (Kinkeldey et al, 2014). This shows that, even if not all visual encodings from the above list are necessarily the best choices with respect to readability, they should be taken into account since an intuitive representation of uncertainty should be the goal. Figure 2: Examples showing the use of visual variables rated as highly intuitive for representation of uncertainty (MacEachren et al., 2012): fuzziness / blur (left), location (center), and color value (right). It seems obvious that for the choice of uncertainty visualization techniques, the dimensionality of the data plays an important role: point data require different techniques than line or polygon data, and with discrete data, such as the population in each state of the US, other approaches may be more successful than with continuous data such as the population density over the whole country. Other crucial requirements that are often neglected are those pertaining to the user (see Usability Engineering & Evaluation). Different types of users can have different tasks in mind, e.g, an expert user with domain knowledge may want to freely explore the data whereas other users may have predefined questions they would like to answer. For a low-level task such as the search for extreme values in an area (e.g., the maximum level of particulate matter air pollution in a city), the uncertainty caused by a lack of data accuracy may be more relevant than for high-level tasks (the decision if and where measures should be taken to reduce air pollution), where the lack of trustworthiness of the data may play a more important role. Data and user requirements are intertwined (the data must fit the user requirements in the first place) and should be taken into account before choosing an uncertainty representation technique. Since there are no standardized procedures for leveraging uncertainty when working with geospatial information, it is essential to include potential target users in the creation process. This can help to ensure that visual representations are understandable and that it is clear to the user what type(s) of uncertainty is/are described. These are crucial requirements for designing representations that successfully support users in uncertainty-aware data analysis and decision making. Beard, M., Buttenfield, B., & Clapham, S. (1991). NCGIA Research Initiative 7: Visualization of Spatial Data Quality, Scientific Report for the Specialists Meeting, NCGIA Technical Paper, 91-26, Santa Barbara, California. Buttenfield, B. P., & Weibel, R. (1988). Visualizing the Quality of Cartographic Data. In Third International Geographic Information Systems Symposium (GIS/LIS ’88), San Antonio, TX. Gerharz, L. E., Autermann, C., Hopmann, H., Stasch, C., & Pebesma, E. (2012). Uncertainty visualisation in the model web. In EGU General Assembly Conference Abstracts, 14, 4421. Longley P. A., Goodchild M. F., Maguire D. J., & Rhind D. W. (2005). Geographic Information Systems and Science (second edition). Chichester: Wiley. McGranaghan, M. (1993). A cartographic view of data quality. Cartographica, 30, 8-19. Pang, A. T., Wittenbrink, C. M., & Lodha, S. K. (1997). Approaches to uncertainty visualization. The Visual Computer, 13, 370-390. Senaratne, H., & Gerharz, L. (2011). An assessment and categorisation of quantitative uncertainty visualisation methods for geospatial data. In 14th AGILE international conference on geographic information science - advancing geoinformation science for a changing world, 3-23. Name and describe types of uncertainty that can occur in geospatial information. Why do they require different visual representations? Place the following uncertainty representation techniques into the UVis3 cube. After placing them in the cube, describe their relative limitations for communicating geospatial data and its uncertainty. 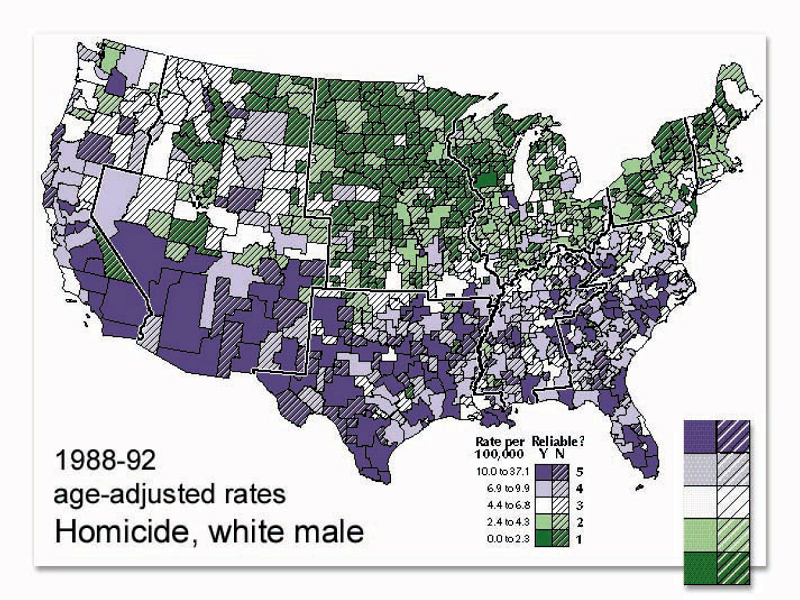 A choropleth map showing homicide rates in the United States with uncertain values marked by a texture (hachure). See MacEachren, A. M., Brewer, C. A. & Pickle, L. W. (1998). Visualizing georeferenced data: representing reliability of health statistics. Environmental and Planning A 30(9), 1547-1561 for related examples. A side-by-side view of two maps, one showing air pollution data, one the related uncertainty, both using a color scale. 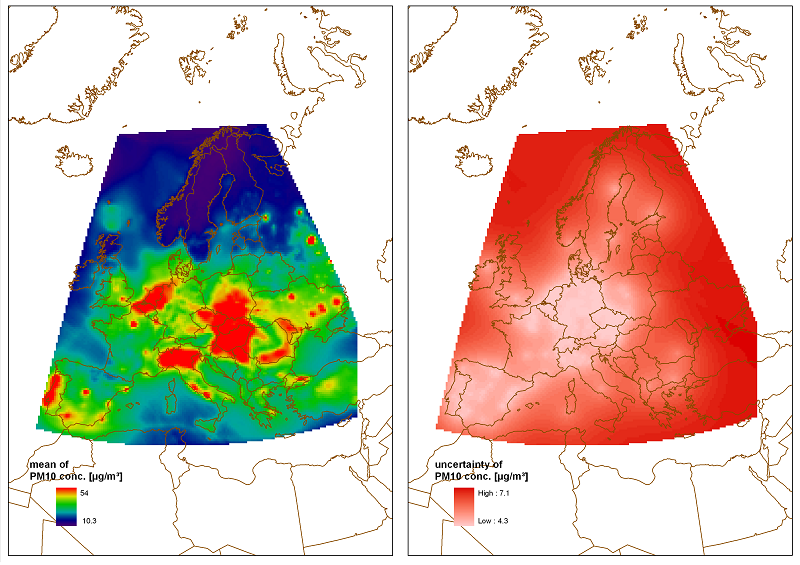 Adjacent maps of mean PM10 concentration in Europe (left) and related uncertainty (right). An interactive air pollution map allowing the user to hover over the map to retrieve the uncertainty in different locations. Source: Statistical dimension in a GIS using Aguila. Reprinted by permission from Springer Nature: Senaratne, H., Gerharz, L., Pebesma, E. & Schwering, A. (2012). 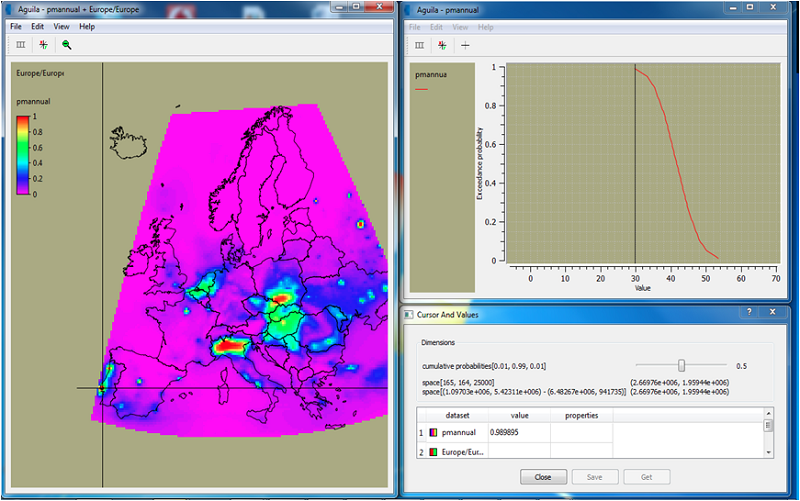 Usability of Spatio-Temporal Uncertainty Visualisation Methods. In Bridging the Geographic Information Sciences: 15th AGILE International Conference, edited by J. Gensel, D. Josselin, and D. Vandenbroucke, Avignon, France. 24–27 April 2012, Berlin: Springer, 3–23. 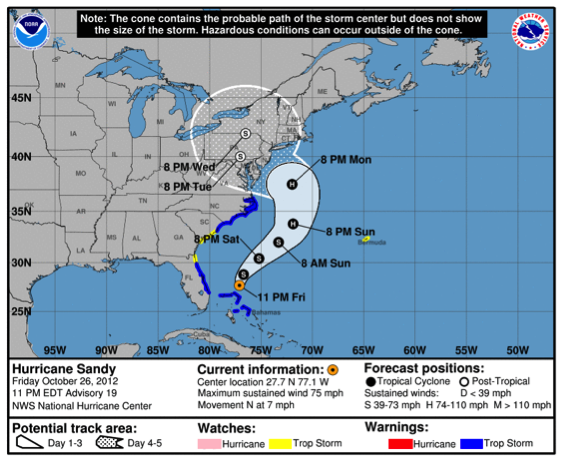 The “hurricane cone of uncertainty” is a technique to represent predicted (uncertain) paths of a hurricane. A white area on a map depicts the most probable predicted locations (66% confidence interval) of the storm center. What are the pros and cons of this approach? What would be two alternative ways to represent uncertain paths? Source: National Hurricane Center website https://www.nhc.noaa.gov/. Why does the suitability of an uncertainty mapping technique depend on the target user? Name an example.